Smart2Pay WooCommerce Plugin connects your WooCommerce store to GlobalPay, the latest payment platform of Smart2Pay. Below you will find the necessary details for WooCommerce websites administrators on how to install and configure the plugin on your WooCommerce store. Current stable plugin version of WooCommerce is 1.0.18. 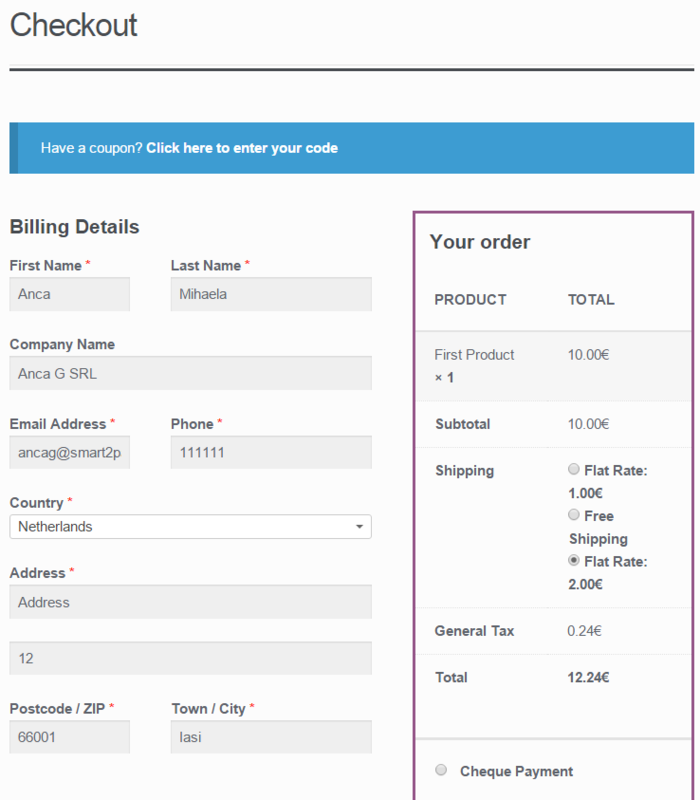 Smart2Pay plugin is compatible with WooCommerce version 2.5.0 + and with WordPress version 4.4.2 +. The installation process of the Smart2Pay Plugin requires first downloading the WordPress platform, WooCommerce plugin, and then uploading the Smart2Pay WooCommerce plugin and installing Smart2Pay PHP-SDK. In order to download the WordPress platform, please go to the download page of https://wordpress.org/download/ and follow the installation instructions. In order to install the WooCommerce plugin, please go to https://wordpress.org/plugins/woocommerce/installation/ and follow the installation instructions. Download the archive from GitHub in your installation folder. Please note: Upon download, the system will rename the directory into woocommerce-master. You will have to change the name of the directory into the correct form woocommerce-smart2pay. 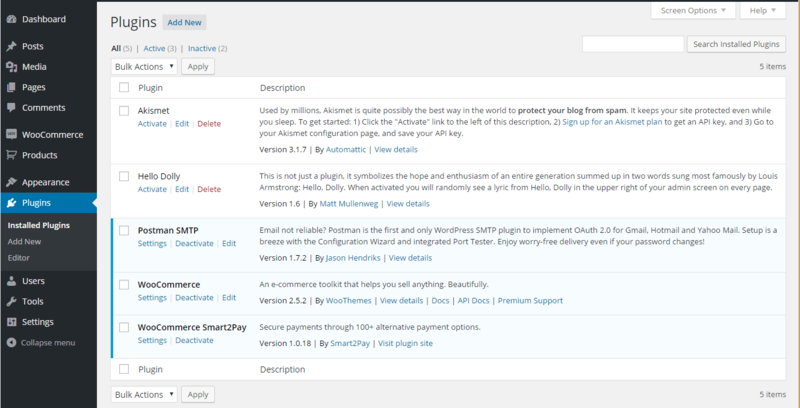 Upload woocommerce-smart2pay directory to the plugins directory from your WordPress dashboard. 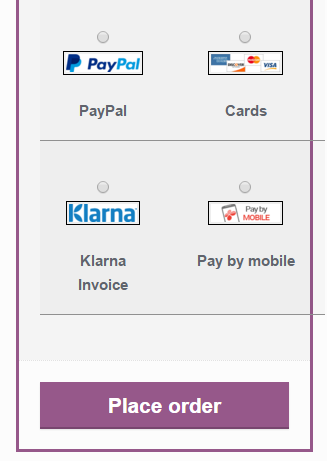 Go to Plugins setting page and activate WooCommerce Smart2Pay. 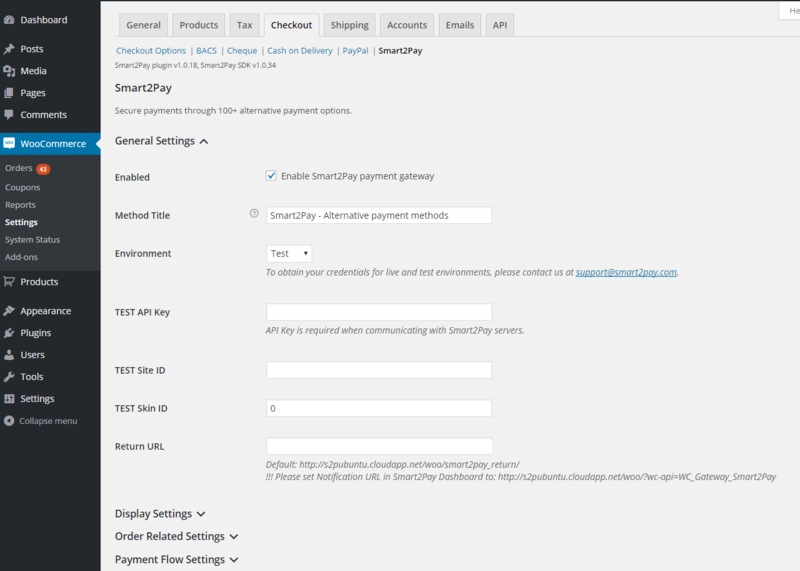 From your WordPress dashboard go to WooCommerce area -> Settings -> Checkout section and navigate to Payment Gateways area where Smart2Pay – alternative payment methods option should be available and click Enable button. 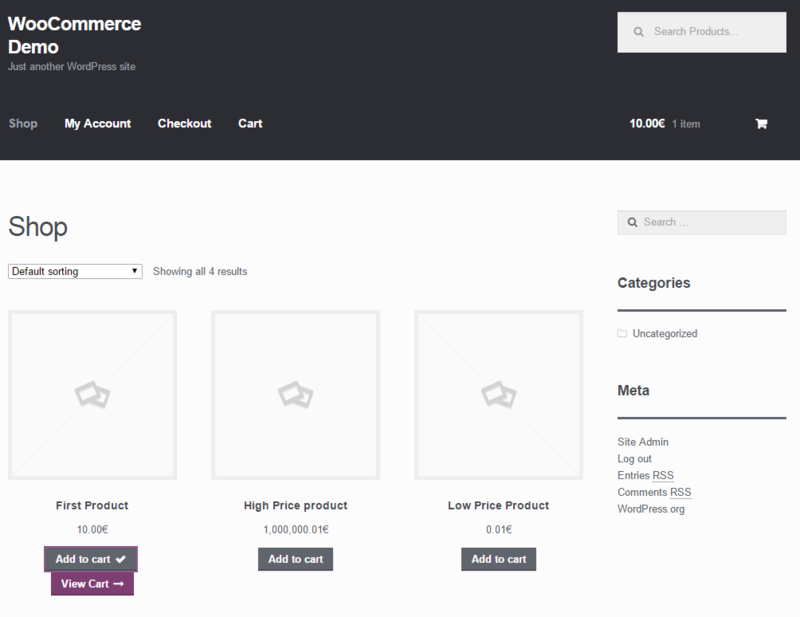 Click the Save Changes button to complete the installation of the WooCommerce plugin. The configurations for the Smart2Pay WooCommerce plugin can be found in the WordPress dashboard under WooCommerce area: Settings -> Checkout -> Smart2Pay. Smart2Pay plugin contains the generic configurations that are necessary to connect your store with the payment platform. 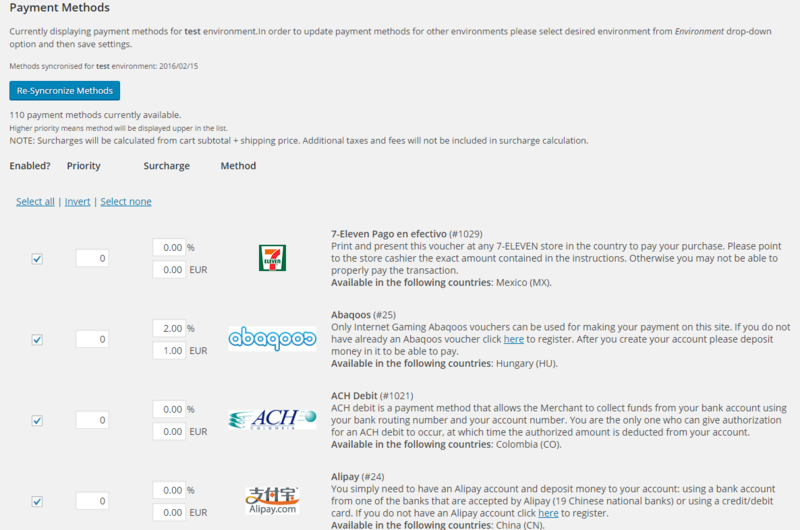 You will also need to install and activate the payment methods that you intend to use: e.g. Smart2Pay Paysafecard, Smart2Pay UKash, Smart2Pay iDEAL etc. If the Smart2Pay payment module is not visible, please make sure that Smart2Pay module is activated from Plugins -> Installed Plugins -> WooCommerce Smart2Pay -> Activate. 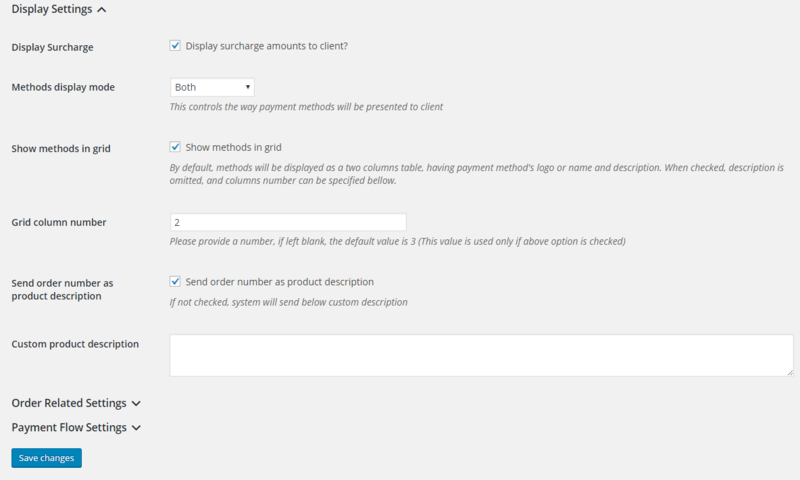 Display Surcharge The display of the surcharge amount in the checkout flow as separated percent and fixed amount. Boolean Display surcharge amounts to client? Order status when SUCCESS You should only deliver the goods/services based on the success notifications. The notifications are received at the notification URL which you set up in the GlobalPay merchant dashboard available at: https://dashboardtest.smart2pay.com. The notification URL is in the form: http://www.merchant.com/index.php?route=payment/smart2pay/callback. 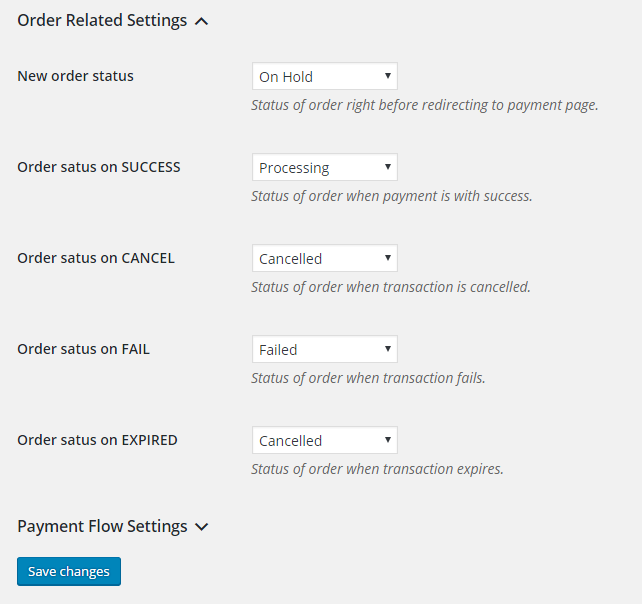 WooCommerce Smart2Pay GlobalPay Plugin automatically updates the order status according to the received notifications. 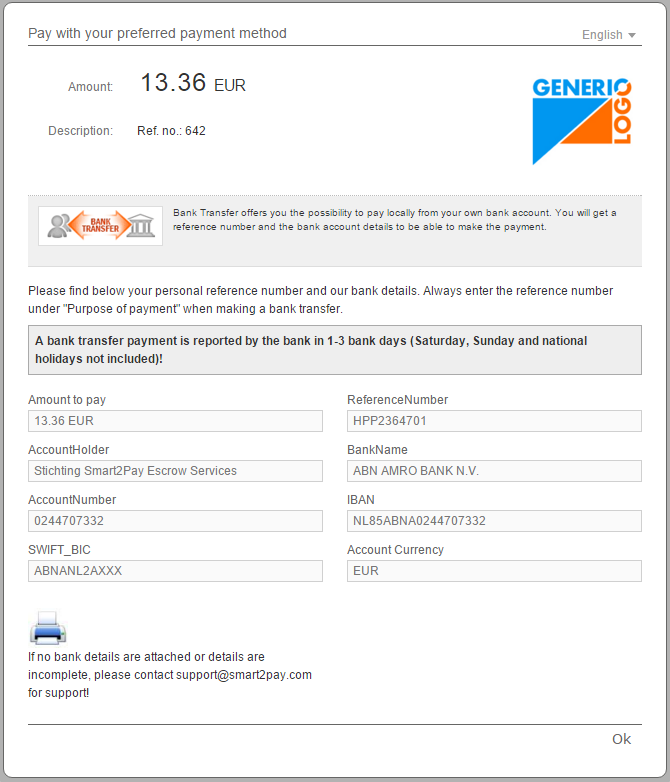 This configuration defines the status of the order when the payment has been successfully completed and a ‘success’ notification is sent by GlobalPay system. You can release the goods/services in this case. Success message The message that is displayed at the end of the payment flow when the redirection status is a success. You should only deliver the goods/services based on the success notification received at the notification URL which you set up in the GlobalPay merchant dashboard available at: https://dashboardtest.smart2pay.com. The notification URL is in the form: http://www.merchant.com/index.php/globalpay/index/handleResponse. String Thank you, the transaction has been processed successfully. After we receive the final confirmation, we will release the goods. Failed message The message that is displayed at the end of the payment flow when the customer is redirected with a failed status. String There was a problem processing your payment. Please try again. Cancelled message The message that is displayed at the end of the payment flow when the customer has canceled the payment. String You have canceled the payment. Pending message The message that is displayed to the customer when the redirection status is unknown or the customer must take additional actions to complete the payment: e.g. go to the bank and make an offline bank transfer. String Thank you, the transaction is pending. After we receive the final confirmation, we will release the goods. Note: Surcharges will be calculated from cart subtotal + shipping price. Additional taxes and fees will not be included in surcharge calculation. The customer adds the product in the shopping. Cart. He has to options: to continue shopping or view cart. In the shopping cart the customer can see the added products and the details of the payment. The customer needs to enter the billing details, including customer and billing address to complete the sign in process. Next to the billing details the customer can see the details of the order. Depending on the billing country of the customer, the activated methods are shown in the checkout process in the Smart2Pay – Alternative payment methods step. After selecting the preferred payment method the customer needs to confirm the order by clicking on the Place Order button. 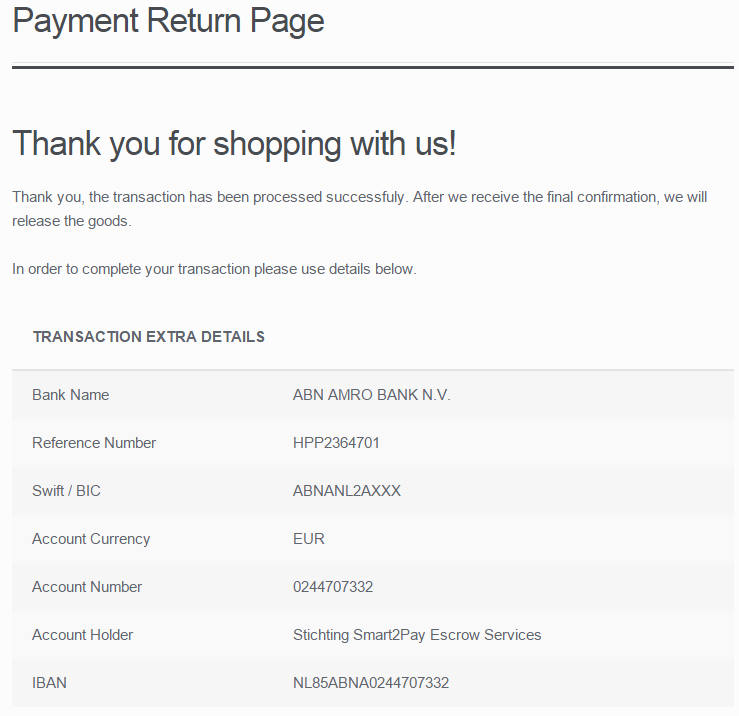 Upon completion of the payment flow, the customer is redirected back to the payment return page. After receiving the final confirmation from the provider, our server notifies WooCommerce about the status change. The plugin handles these notifications and updates the order accordingly. 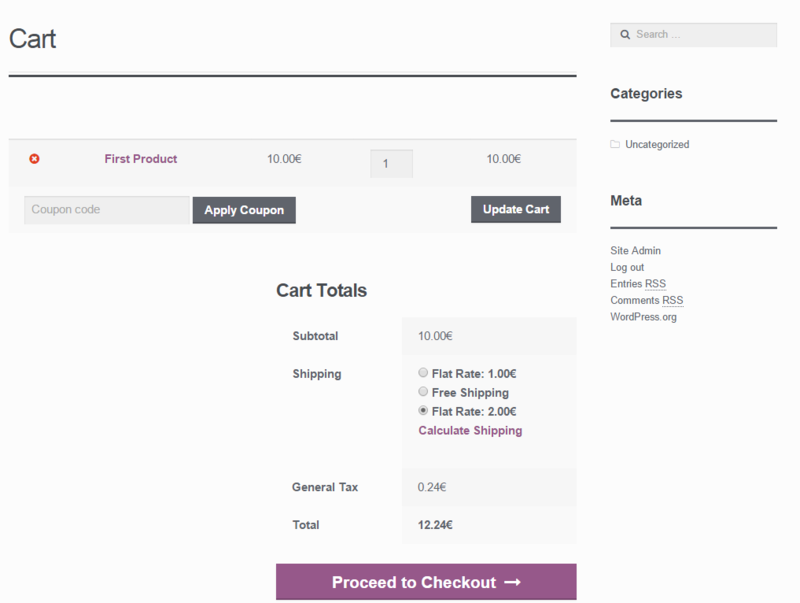 This can be checked in WordPress Dashboard in WooCommerce area -> Orders.